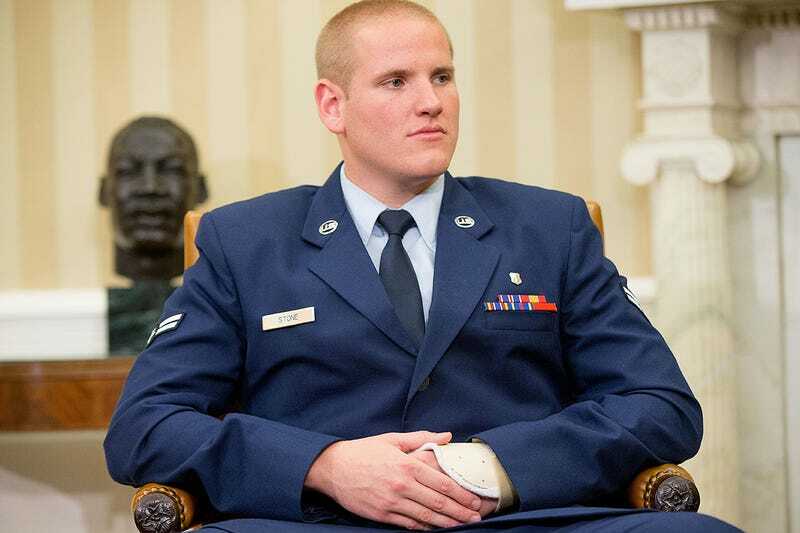 Airman Spencer Stone, who was decorated with multiple medals including the Purple Heart after he and two of his friends disarmed terrorist Ayooub El-Khazaani on a French train this summer, was repeatedly stabbed in the chest early this morning in Sacramento, California. The attack came at approximately 12:45 a.m. on a street corner near a bar district in downtown Sacramento. Apparently the attack happened after or was a continuation of a fight involving Stone. The assailant (or assailants) are currently not known. Stone survived the attack and is in stable condition at this time, according to the U.S. Air Force. Stone was also stabbed multiple times by El-Khazaani with a box cutter while Stone and his friends attempted to subdue the would-be terrorist. His incredible story, which should have ended with Stone being shot in the head, was recounted on the Jimmy Kimmel show last month. Update 11:40AM PST: Suspects described as two Asian males wearing white t-shirts and blue jeans and driving a black Toyota Camry.